The Thaw at Vétheuil forms part of the series of canvases painted by Claude Monet at the time when the ice began to break up in the Seine after the river had frozen in the winter of 1879. Always keen to record the ephemeral, ever-changing appearance of water, the artist sought here to capture the break up of the frozen layer into ice floes which were then carried downstream by the current. The landscape format highlights the dominant horizontal composition, broken only by the vertical thrust of the trees and their downward reflection in the water. Using loose, deft brushstrokes and a reduced palette, Monet creates a hazy effect that accentuates the bleakness of this harsh winter landscape, conveying a sense of desolation and melancholy. “Bergson in his philosophy, Proust in his novel and Monet in his series are obsessed by the idea that neither we ourselves nor things remain the same, that they do not preserve their identities intact: every new second brings a modification that transforms their very nature, ” wrote René Huyghe to explain the fresh appreciation that was given to the passage of time at the end of the nineteenth century and was so important to the development of the art of Monet and the Impressionists. Impressionism was the first modern art movement to become aware of art’s difficulty in capturing the changing conditions of reality. Conscious of the problem, Monet began to repeatedly paint similar themes under different atmospheric conditions in order to bear witness to the changes brought about by light and time. All the paintings in the series attest to Monet’s preference for horizontal planes. In these works he used particularly elongated formats to further emphasise the dominant horizontal of the compositions that is interrupted only by the verticals of the shrubs and trees and their reflections in the water. The artist takes full advantage of the vagueness of the scene, employing loose, rapid brushstrokes and a reduced palette to exaggerate the harshness of that winter, which was described as Siberian, and succeeded as never before in capturing a winter atmosphere that conveys feelings of neglect and melancholy. The silence and calm transmitted by these paintings bring to mind the artist’s sadness following the recent, early death of Camille, his wife. In the catalogue raisonné of Monet’s work the painting is dated to 1880 and included among those probably sold by the artist to Durand-Ruel in February 1881. 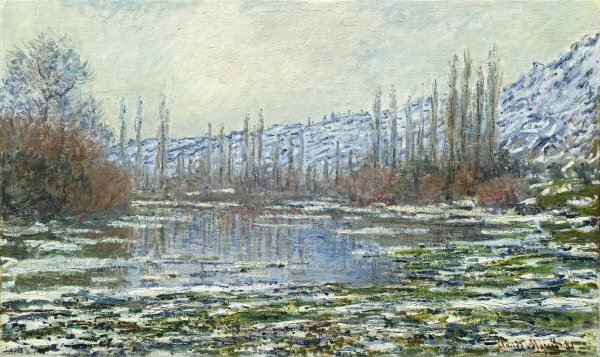 Possible explanations for the fact that the canvas is signed and dated 1881 may be that, as on other occasions, the signature was added at the time of the sale, or that Monet did not actually paint it outdoors while the thaw was taking place but some time later, in his studio.